Older property, no elevator, but very clean. Would stay again. Rooms were clean. Rooms should have fridge and/or microwave for added convenience. Property is very rundown as far as painting, trash. Room was great. They have truck and trailer parking out front which was perfect. Typical Motel 6. Pet friendly but no frills. Wish the TV got more channels. Staff was friendly and welcoming. Bryan came and picked us up from the Amtrak station --awesome customer service. Room was comfortable and very clean. Bathroom was clean except the airvent needed a good dusting. Surfaces were clean, floor needed washing. Good place to stay, felt safe. I could park right outside the room. Great wi-fi. I would stay here again. Heard they were renovating. Room with two double beds is small and crowded. It was clean and warm on a cold night, but the most basic of acceptable accommodations. Good value, if you're just looking to stay for the night. If looking for affordable acceptable accommodations while passing through it'll do. Wifi works well. For a quick night stay it is clean, convenient, has a laundry facility very handy. Just bring your own pillow and you will rest easily. Usual amenities, coffee, tv, wifi, ice. Inexpensive. Clean and comfortable. Next to Tamarisk restaurant which is probably the best place to eat around there. Old TV. Terrible cable. Stained carpet. A/C not great. Good location and pool. Friendly staff. Hotel needs updating. We had truck and trailer were able to park in view from room. Room clean and comfort. Great value motel! You get what you pay for! We stayed for one night during road trip between moab to capitol reef national park. The staff was very friendly. The room it's self was small no microwave no fridge no tub. We stayed two night and 4 people there was not enough towels for even 4. The room was never swept in between the nights. I'm not picky, my wife is. For me...making a long distance one-way solo trip this is just fine. Clean room, like the really old Holiday Inn style....but it works! Older but still decent, door didn't fit jamb, shower didn't got hot enough, heat/AC unit was rough and too noisy, no shampoo. We were there to dirt-bike and we just needed a place to sleep. The price was the deciding factor. Clean room, comfortable bed, fixed warm water (not hot) in the shower, easy check-in, express check-out. You can hear the people who leave early in the morning in the parking lot. Pleasant place to stay for a night or two while traveling. It is a no frills hotel but my room was very clean, and quiet, my bed was comfortable. Exactly what I needed for a one night stay. It was easy on and off the freeway. Within a short walk of John Wesley Powell River History Museum, Motel 6 Green River UT is within 2 miles (3 km) of Green River State Park Golf Course. 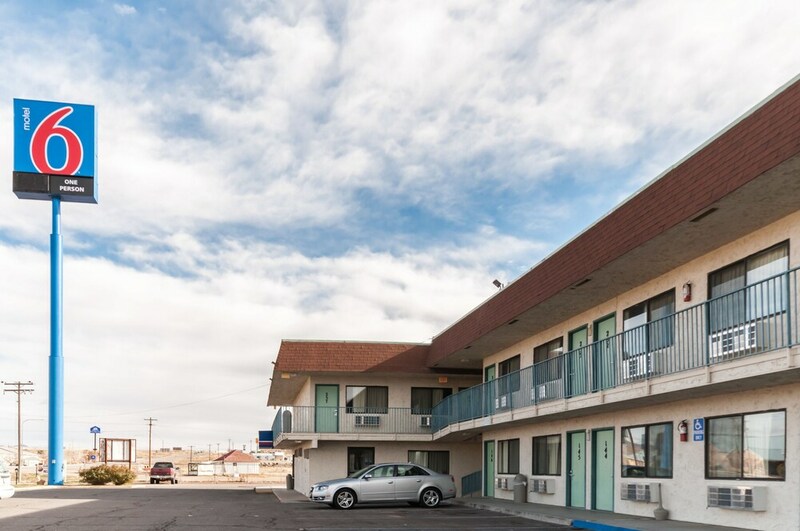 This 103-room motel welcomes guests with conveniences like free in-room WiFi, free self parking, and coffee/tea in a common area. Guests can expect to find free WiFi and 32-inch a flat-screen TV with cable channels. Other standard amenities include free local calls and a desk. Guests of Motel 6 Green River UT enjoy access to free WiFi in public areas, a seasonal outdoor pool, and coffee in a common area. If you plan to drive, free parking is available. The 24-hour front desk has staff always at the ready. Additional amenities include laundry facilities and a vending machine. Thank you for your comment. Hope you will stay again with us. Thank you for staying for us hope we can see you again soon . Thank you for your feedback and we appreciate you staying with us during your travels. Recreation features at Motel 6 Green River UT include a seasonal outdoor pool. The preferred airport is Grand Junction, CO (GJT-Grand Junction Regional).